Both the Prince of Wales and pickpockets were regular visitors to the race course at East Winch, the annual race meeting being one of the highlights of the West Norfolk social calender. The Races were held in the village for twenty years until they moved to Fakenham in 1904. They began in 1884 when the West Norfolk Hunt held their first meeting on Saturday 12th April under Grand National Hunt rules. The course was a left handed course, over arable fields, made up mainly of naturally formed jumps, and a brook which was jumped twice. The first year there were only two races. There were 8 runners for the first, a light weight Steeplechase of 12 stone for a 2 sovereigns purse. Mr H C Bentley's horse Useful won but was disqualified for having previously run at a meeting not under Grand National Hunt rules and for having run under the rules of racing since she was a two year old. Martyr belonging to T Everitt was then awarded first place. Martyr then went on to take third place in the second race, behind Mr A C Fountaine's Frederick and A W Jarvis's Conjuror. In 1885 there were three races. The following year it was decided to form the West Norfolk Hunt Club. The only people being eligible to join were members of the committee of the West Norfolk Hunt. The Prince of Wales was approached to become its president. His secretary replied "His Royal Highness desires me to say that it will give him great pleasure to become President of the West Norfolk Hunt which is being formed. His Royal Highness hopes you will be particular about whom you admit to the Club"
The members of the Hunt Committee also formed the majority of the magistrates who sat on the Grimston Bench, and it was to here that the felons arrested at the course were brought. A local race meeting is frequently selected by the "swell mob" as a favourable opportunity for exercising their craft. It is stated that several of these "gentlemen" arrived in Lynn. As soon as the passengers for East Winch began to assemble on the Lynn station they commenced "business" which they continued throughout the afternoon. The circumstances connected with some of the thefts are not without a humorous side to them notably one in which a man lost £3.10.00, was met by a friend and asked if he was not going for a drink, he replied in distressed tones that the had lost his purse whereupon his friend commenced to act the part of Job's comforter and said "Ah, you should have one like mine!" feeling in his pocket he found that he too, had been victimised. The following week a letter from "one of the public" harangued the stewards and officials for allowing the betting fraternity onto the ground. He was concerned that simpletons were being easily exploited and that the betting men should be punished for their folly; there is no reason he said, why a pleasurable day should not be altogether disassociated from some of the grosser evils which bring discredit upon the turf. In future years Chief Constable Ware in conjunction with the Metropolitan police and the Great Eastern railway police placed plain clothes policemen to keep an eye on the "light fingered fraternity"
Advertisements were placed in the Lynn papers a week before the races saying that no hawkers stalls and barrows would be allowed in. in 1894, in beautifully fine weather, The Prince and Princess of Wales and Princess Maud their youngest daughter attended with a party of guests, Princess Maud and her mother drove to see the water jump in the principal race and afterwards with a Kodak camera took photographs of several of the horses in the paddock. Ordinary folk mostly arrived by train, in 1891 eight special trains were laid on to convey 8,000 race goers Great Eastern railway employees were on duty at all stations along the line to ensure there was no trouble. Luncheon and refreshments were served in two marquees supplied by Mr Skipper of Norfolk Street Lynn, with 12,000 people in the ground and no stalls and hawkers allowed. It must have been the races themselves that were the draw, and of course the opportunity to see the royal family. 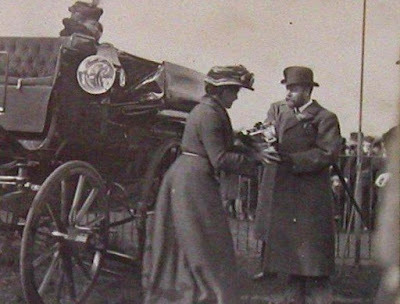 Although in 1901 no Royalty were present due to the death of Queen Victoria the new King Edward VII presented a handsome silver cup for the second race. This replaced a previous cup so 5 races continued to be run. The fifth was always a Selling Steeplechase where the winning horse was auctioned after the ride. The distance run was 2½ miles, the entry fee being 1 sovereign, the prize was 25 sovereigns. In 1902 at the Annual General Meeting held at the Globe hotel King's Lynn there was much discussion about whether the jumps were too big. "People were reluctant to bring their horses if the fences were to be such mountains" Mr Goodwyn stated. He wanted them lowered if the going was wet and heavy. Mr Keppel and Mr Fountaine argued that they should remain as they were. Mr Goodwyn replied "build them as high as you like if it is good going, but last year it was a crippler, and no brute could get over it". His argument carried the day. The 1903 AGM again expressed concerns about the state of the course and felt a more suitable venue should be sought. In 1903 the King's Cup was won by Miss North's horse Ivanhoe with Mr Seymour as jockey. 1904 was to be the last year the races were held at East Winch before transferring to Fakenham. It was held in brilliant sunshine on Easter Monday. The local paper reported "It was an ideal day for racing with scarcely any wind, and probably this accounted for the many who came in almost summer attire, the dresses of some ladies being very pretty", no members of the Royal Family were present. Miss North was unable to repeat her success of the previous year, Ivanhoe coming second to Mr J H Coker's Longnor. The bookmaking fraternity were there in full force and a lot of money changed hands. The newspaper summed up that last day by saying Sir Wm Ffolkes duties as judge were not arduous, his having being no difficulty in deciding who were the winners, Sir William must have breathed a sigh of relief for the correspondence columns of the local paper were filled in previous years with letters from disgruntled demanding stewards enquiries, apologies over disqualifications and lodging appeals. Nothing now remains of the race course but imagine the excited crowds tumbling from the train at East Winch station and walking the last half mile to see the first race at 1pm. Climbing the hill out of East Winch towards Kings Lynn, as you reach the Blackborough End turn to the left, look to your right and there in the dip you will almost imagine you can hear the cheers for the winners and see the hats thrown into the air at the arrival of the Royal family.